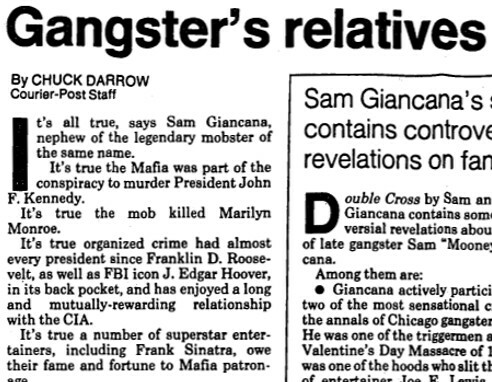 It’s all true, says Sam Giancana, nephew of the legendary mobster of the same name. It’s true the Mafia was part of the conspiracy to murder President John F. Kennedy. It’s true organized crime had most every president since Franklin D. Roosevelt, as well as FBI icon J. Edgar Hoover, in its back pocket, and has enjoyed a long and mutually-rewarding relationship with the CIA. It’s true a number of superstar entertainers, including Frank Sinatra, owe their fame and fortune to Mafia patronage. And Giancana says he’s in the position to know. Giancana, 38, is co-author, with his father, Chuck of Double Cross (Warner Books, $22.95), the explosive new biography of the late Chicago gangster, Sam “Mooney” Giancana. The authors are, respectively, the legendary mobster’s nephew and half-brother. Entertainingly written by the pair (and Giancana’s wife, Bettina) in the third person, the book can best be described as GreatFellas, for it is the ultimate gangster chronicle. In its pages are tales of treachery and corruption that even the most lurid pulp writer couldn’t conjure. Nothing is left out or watered down, from Giancana’s early days as a victim of brutal child abuse to his blood-stained ascendancy through Chicago’s organized hierarch of the 1920s and ‘30s to his reign during the ‘50s an ‘60s as a figure so powerful he could influence international politics, including America’s escalation of the Vietnam War. “We decided, after all these years, to set the record straight, because of his national and international involvement,” said Giancana of hi slate uncle during a recent promotional visit to Philadelphia. The book’s starting tales were provided by Chuck Giancana. “Mooney went to great lengths to keep his younger brother from ever being involved in anything more nefarious than bootlegging and illegal gambling. But he passed on to Chuck details of even the most serious mob projects, including the assassination of JFK, before it happened in November 1963. Chuck Giancana kept the secrets to himself for decades, partly out of loyalty and, no doubt, partly out of fear. But he changed his mind in 1983, eight years after his brother was murdered in his suburban Chicago home by someone whose identity remains a mystery. Double Cross by Sam and Chuck Giancana contains some controversial revelations about the life of late gangster Sam “Mooney” Giancana. Giancana actively participated in two of the most sensational crimes in the annals of Chicago gangster history. He was one of the triggermen at the St. Valentine’s Day Massacre of 1929 and one of the hoods who slit the throat of entertainer Joe E. Lewis, ruining what was Lewis’ promising singing career.